Lend a Hand Uganda-USA Hosts its 4th Annual Poker Tournament to Expand its School Lunch Program with Celebrity Ambassador and World Series of Poker Player Andy Frankenberger; Proceeds go Towards the Construction of a New Kitchen & Cafeteria in Heritage Junior School in Ggangu. 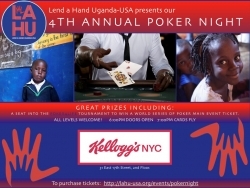 New York, NY, September 19, 2018 — On Thursday, October 11th, Lend a Hand Uganda-USA (LAHU-USA) will be hosting its Fourth Annual Poker Tournament at Kelloggs NYC to support its newest project: providing healthy lunches and a needed kitchen & cafeteria for LAHU-USA “adopted” school in the Wasiko district of Uganda, the Heritage Junior School in Ggangu. Last year’s event raised $5,000 which enabled the organization to expand the lunch program and bring clean running water to Ggangu. Meeting this year’s fundraising goal of $15,000 will enable LAHU-USA to build a cafeteria on the school’s grounds, allowing more children to participate in the lunch program. Players can join at multiple levels, starting with the most basic: an individual poker buy-in for $150, with multiple drink package options for wine and beer or signature cocktails with an additional donation. There are many exciting prizes to be won and the top prize of the night includes a seat at the 2019 Poker4Life Lucky “13” Annual Charity Poker Championship. All proceeds from this event will go towards providing healthy lunches, cafeteria construction materials, labor, and educational resources to create a safe, sanitary learning environment for young children. The benefit will be held at Kellogg’s NYC, 31 East 17th Street, from 6:00 p.m. to 10:00 p.m. Cards fly at 7:00 p.m.
LAHU – USA is a registered 501(c) (3) non-profit organization, based in New York City. LAHU-USA is committed to facilitating empowering, sustainable change in both urban and rural Uganda. They strive to give community members the tools, training, and support to maintain and grow each project, and believe that this holistic approach fosters permanent change that will improve lives. They do so by adopting 1 school and community at a time through education and more. For more information about LAHU-USA, please visit www.lahu-usa.org, Twitter or Facebook @LAHUUSA, or follow #LAHUUSApoker.